The aim of this study was to determine whether the routine use of subcutaneous drains can reduce the wound complications following cesarean section (CS). CS is one of the most common operative procedures performed in modern obstetrics. One of the most common complications of CS is surgical site complications, including infection, seroma formation, and disruption. One of the common, yet debatable, practices in CS is the use of a subcutaneous drain for the wound. This is a randomized controlled study that was conducted at the obstetrics and gynecology department, Menoufia university hospitals. The study included 200 patients who were subjected to CS. They were divided into two groups: group 1, which included patients in whom a subcutaneous drain was used, and group 2, which included patients in whom no subcutaneous drain was used. The duration of surgery and the duration of hospital stay were recorded. The patients were followed up and the following complications were assessed: wound infection, wound seroma, wound disruption, postoperative pain, and postoperative fever. Use of subcutaneous drains significantly reduced wound seroma (21% in the no drain group and 3% in the drain group), wound disruption (38% in the no drain group and 9% in the drain group), the need for redressing (41% in the no drain group and 12% in the drain group), and postoperative pain (a mean ± SD of 5.4 ± 0.9 in the no drain group and 2.76 ± 1.17 in the drain group). There was no significant difference as regards wound infection or the duration of postoperative hospital stay. We found that the routine use of subcutaneous drain for lean women undergoing CS can only reduce wound seroma, wound disruption, postoperative pain, and the need for redressing. However, there was no added benefit as regards other wound complications such as wound infection and postoperative fever. Cesarean section (CS) is one of the most common operative procedures performed in modern obstetrics . Despite that, surgical techniques and steps do widely vary . These variations depend on many factors, which include surgeon's preferences, patient's characteristics, and available facilities and circumstances . One of the most common complications of CS is superficial surgical site complications, including sepsis, seroma formation, and breakdown . One of the common, yet debatable, practices in CS is the use of a subcutaneous drain for the wound. The advantage of such a practice is that any blood or serous fluid that may accumulate in the subcutaneous space, which causes postoperative pain or provides a good medium for microbial growth and infection, can be drained . Thus, it is assumed that drains can reduce the burden of surgical site infection. Some surgeons, however, have raised much argument about the value of subcutaneous drains . Despite this, it is evident that it is still widely used in the clinical practice . In this study, we aimed at providing answers for this critical issue so as to provide the best quality of care following CS. This study is a randomized controlled study conducted at the Department of Obstetrics and Gynecology, Menoufia University hospitals, from December 2015 to December 2016. Patients were randomly allocated to the drain or the no drain group. Randomization to two groups was carried out using computer-generated numbers with 1:1 ratio. Patient names were hidden and replaced by numbers. Allocation was conducted using the sealed envelopes method and was only opened after uterine closure. Immunocompromised women: AIDS patients and those receiving immunosuppressant agents. Patients were divided into two groups. Group 1 (100 patients) included patients to whom repeated CS was performed with insertion of subcutaneous drain. Group 2 (100 patients) included patients to whom repeated CS was performed without insertion of subcutaneous drain. Preoperative evaluation included thorough history taking, general examination, and obstetric examination. Preoperative investigations were carried out for all patients. Type of anesthesia: spinal anesthesia was induced for patients. A standard surgical technique was performed. The maximum thickness of the subcutaneous tissue was measured in centimeters before we entered the peritoneal cavity. A single dose of antibiotic prophylaxis of 2 g of intravenous cefazolin was administered to each woman after umbilical cord clamping. The lower segment uterine incision was closed in two layers with continuous synthetic absorbable vicryl 1 suture (Polysorb; Dublin, Republic of Ireland). The peritoneum was not closed. The rectus sheath was sutured using continuous absorbable synthetic vicryl 1 suture (Polysorb). In the drain group, a closed nonvacuum drain (Arab Medical Industry, Borg El Arab, Alexandria, Egypt) was inserted in the subcutaneous tissue and exited from the skin through a separate opening and stitched to the skin. The subcutaneous tissue was not sutured. Cautery was used for hemostasis. The skin was closed with a continuous nonabsorbable polypropylene 2/0 (Acufirm; Ernst Kratz, Germany) subcuticular sutures. Operative time was estimated from the start of skin incision until the end of skin suturing. The drain was left until the drainage rate was less than 50 ml/day. All procedures were performed by the same team. All patients were subjected to follow-up during postoperative stay in Menoufia Hospital to be followed up with regard to postoperative pain, postoperative fever, hospital stay duration, wound infection, wound seroma, wound disruption, and the need for redressing. The postoperative pain was judged after 24 h using visual analogue scale (VAS), which is a continuous scale that is 10 cm (100 mm) in length. Postoperative pain intensity is described as follows on the pain VAS: no pain, 0–4 mm, mild pain, 5–44 mm; moderate pain, 45–74 mm; and severe pain, 75–100 mm. All women were given ketorolac tromethamine (Ketolac, Amriya pharm industries, Alexandria, Egypt) 30 mg, intramuscularly, ampoule/6 h for the first 24 h.
Patients were discharged from the hospital 24 h after the surgery if there were no postoperative complications. Follow-up of patients was for 1 week after the surgery in the Menoufia University Outpatient Clinic. Data analysis was conducted using statistical package for the social sciences (SPSS, v. 22, IBM, Armonk, New York, United States) program. Student's t-test and analysis of variance was used to compare the mean wound infection (or other outcomes) among different groups. The χ2 test was used to compare categorical variables and a P value less than 0.05 was considered statistically significant in all these tests. In the current study, 200 patients, for whom repeated CS was performed, were divided into two groups; each group included 100 patients. In group 1, subcutaneous drain was inserted, and in group 2 a subcutaneous drain was not inserted. There was no statistically significant difference between the two groups as regards age, parity, gravidity, gestational age, subcutaneous tissue thickness, and BMI [Table 1]. 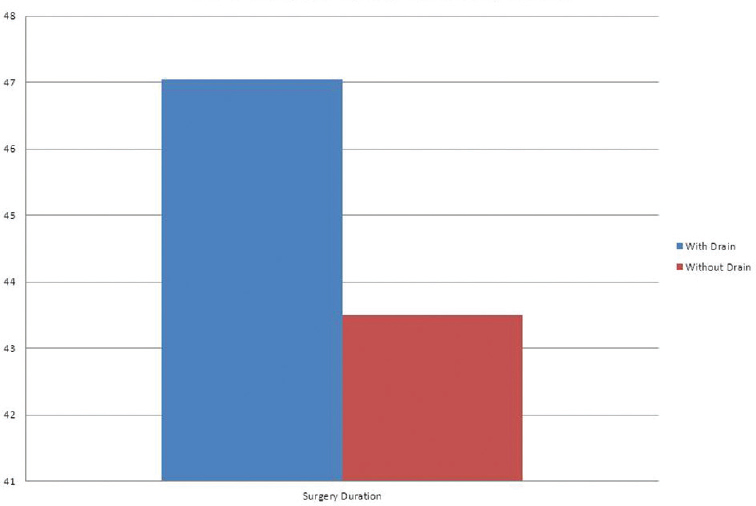 We assessed surgery duration in both groups and there was a significant statistical difference between the two groups. In the drain group, the mean was 47.05 ± 5.2 min and it was 43.5 ± 4.8 min in the no drain group (P = 0.001) [Figure 1]. Figure 1: Difference between the drain and no drain groups as regards the duration of surgery. As regards the duration of postoperative hospital stay, there was no significant statistical difference between the two groups. In the drain group, the mean was 2.5 ± 1.9 days and it was 2.4 ± 2.3 days in the no drain group (P = 0.6) [Table 2]). As regards postoperative wound complications, there was no significant statistical difference between the two groups as regards the rate of wound infection. The incidence was 9% in the drain group and 14% in the no drain group (P = 0.24) [Figure 2]. Figure 2: Difference between the drain and no drain groups as regards wound infection. 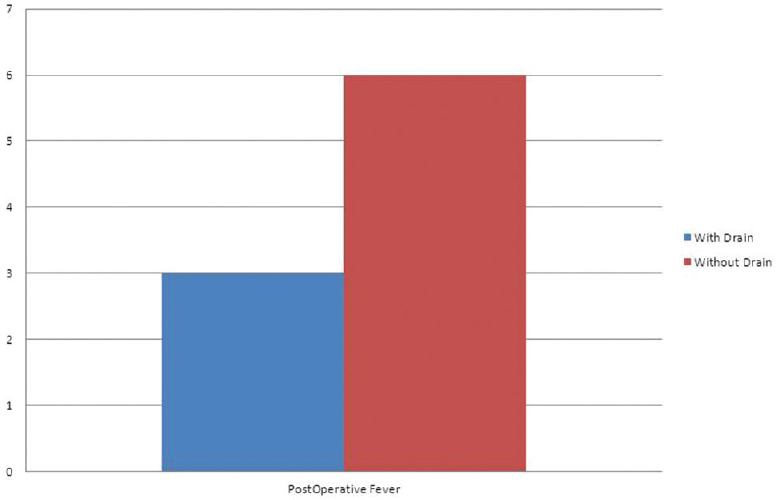 Moreover, as regards postoperative fever, there was no significant statistical difference between the two groups. The incidence was 3% in the drain group and 6% in the no drain group (P = 0.2) [Figure 3] and [Table 3]. Figure 3: Difference between the drain and no drain groups as regards the postoperative fever. There was a significant statistical difference between the two groups as regards the rate of wound seroma. 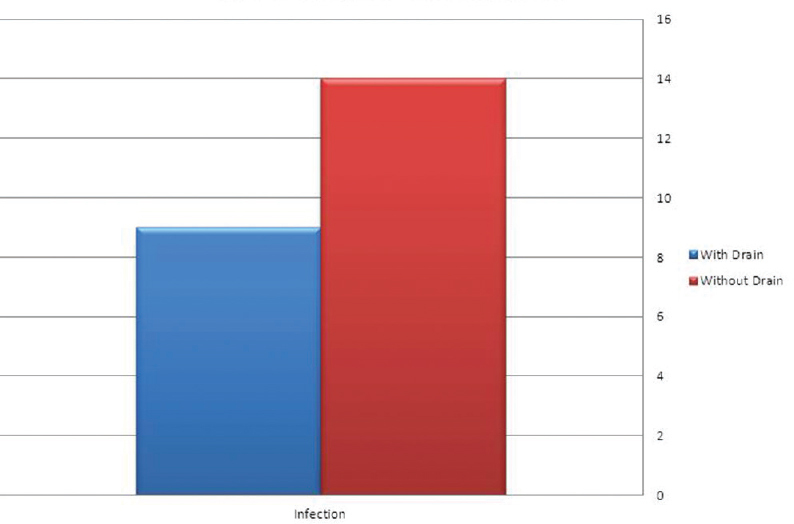 The incidence was 3% in the drain group and 21% in the no drain group (P = 0.001) [Figure 4]. Figure 4: Difference between the drain and no drain groups as regards the wound seroma. 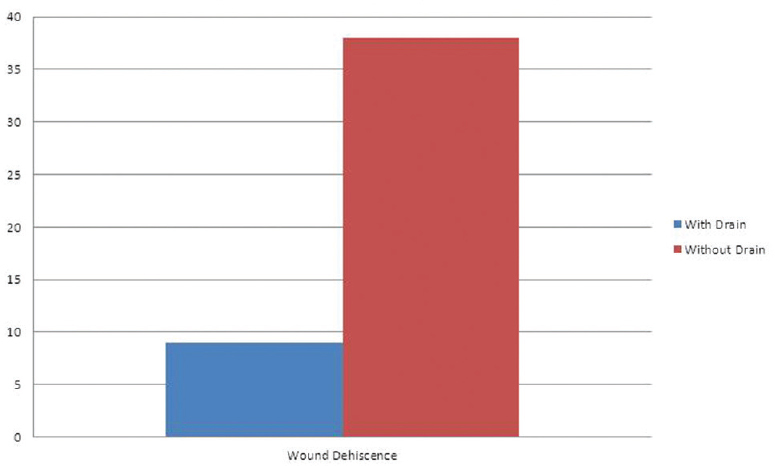 Moreover, as regards wound disruption, the incidence was 9% in the drain group and 38% in the no drain group (P = 0.001). As regards the need for redressing, the incidence was 12% in the drain group and 41% in the no drain group (P = 0.001) [Figure 5] and [Table 4]. Figure 5: Difference between the drain and no drain groups as regards wound disruption. As regards postoperative pain, there was a significant statistical difference between the two groups. In the drain group the mean was 2.76 ± 1.17, and it was 5.4 ± 0.9 in the no drain group (P = 0.01) [Table 5]. In an era where the rate of cesarean delivery is rising, performance of optimal surgical techniques to minimize complications from cesarean delivery is of great clinical importance . The use of prophylactic drain placement to prevent wound complication, however, is controversial and investigations that have evaluated its efficacy in this setting have reported conflicting results . The present study was conducted to compare the outcomes of subcutaneous drainage versus no drainage in the wound complications after CS. As regards the preoperative data in this study, there was no significant statistical difference between the two groups as regards age, gravidity, parity, BMI, and the subcutaneous tissue thickness to ascertain that the postoperative outcomes will be related mainly to the selected procedure. Uniquely to our study, obese women were excluded, and hence all women were with BMI less than 25 kg/m 2, and there was no significant statistical difference between the two groups as regards BMI of the participants, abolishing the effect of obesity on the outcomes. Unlike our study, several studies did not exclude obese women. Khalifa et al. , in their randomized controlled study on 170 women, aimed to compare the effect of routine subcutaneous drain versus no drain on wound complications in CS for diabetic obese women . The mean BMI was 34.1 ± 1.9 kg/m 2 in the drain group and 34.2 ± 1.7 kg/m 2 in the no drain group (P = 0.1) . Similarly, Magann et al. conducted a randomized controlled study on 590 women to compare the effect of subcutaneous stitch closure versus subcutaneous drain to prevent wound disruption after cesarean delivery. The mean BMI was 40.7 ± 12.7 kg/m 2 in the drain group and 39.4 ± 8.6 kg/m 2 in the no drain group (P = 0.39) . Others such as Ramsey et al. performed a randomized controlled study that included 280 obese women to compare the effect of subcutaneous tissue approximation alone with subcutaneous tissue approximation in combination with a drain; no wound complications in obese women undergoing cesarean delivery were reported. The mean BMI was 48.0 ± 11.4 kg/m 2 in the drain group and 45.0 ± 9.2 kg/m 2 in the no drain group (P = 0.019) . In our study, we found that the operation time was significantly shorter in the no drain group than in the drain group, which may be attributed to the time taken for the drain insertion and then exiting it from the skin through a separate opening and stitching it to the skin. We agree with Ochsenbein-Imhof et al. , who conducted a randomized controlled study on 305 women to determine the benefit of cesarean wound drainage in low-risk pregnant women. The mean was 43.5 ± 4.8 min in the no drain group and 47.1 ± 5.2 min in the drain group (P = 0.001), and this was also attributed to the time consumed for drain insertion . Other studies found no significant statistical difference as regards operative time. Magann et al. reported a mean operative time of 45.1 ± 18.2 min in the no drain group and 46.8 ± 19 min in the drain group (P = 0.6). In our study, there was no significant statistical difference between the two groups as regards postoperative wound infection. In this perspective we agree with Khalifa et al. , who found that the drain group and the no drain group had comparable incidence of wound infection (6 vs. 8%, respectively, P = 0.6). Moreover, in the study by Magann et al. , wound infection was diagnosed in 7% of cases in the drain group and in 8% of cases in the no drain group (P = 0.88). Al-Inany et al. , in their randomized controlled study on 120 women, aimed to determine whether closed subcutaneous drainage systems were efficacious in reducing the rate of wound breakdown of pfannenstiel incision after CS in obese women; they also could not demonstrate significant differences in the incidence of wound infection between the drain group and the no drain group (5 vs. 12%, respectively, P = 0.08) . Allaire et al. conducted a randomized controlled study on 76 women to determine whether subcutaneous drain decreases the incidence of wound complications in obese women undergoing cesarean delivery. They showed that there were no cases of wound infection in the drain compared with 4% in the no drain group, yet this difference was not significant (P = 0.34) . Our study showed that there was a significant statistical difference between the two groups as regards the rate of wound seroma. This high incidence in the no drain group may be attributed to the fact that in the no drain group we did not suture the subcutaneous tissue. Other studies also showed this, such as the study by Khalifa et al. , who found that the incidence of wound seroma was 9% in the drain group and 23% in the no drain group (P = 0.01). Moreover, Kumar  in a randomized controlled study on 148 women to compare subcutaneous drain versus subcutaneous stitch closure to prevent wound disruption after CS showed a significant difference. The incidence of wound seroma was 0% in the drain group and 12% in the no drain group (P = 0.02) . Other studies did not show a significant difference between the two groups. Allaire et al. in their study reported that the incidence of wound seroma was 0% in the drain group and 12% in the no drain group (P = 0.09). Moreover, Magann et al. in their study reported that the incidence of wound seroma was 1.5% in the drain group and 3% in the no drain group (P = 0.53). Ramsey et al. found that the incidence of wound seroma was 10% in the drain group and 11% in the no drain group (P = 0.55). 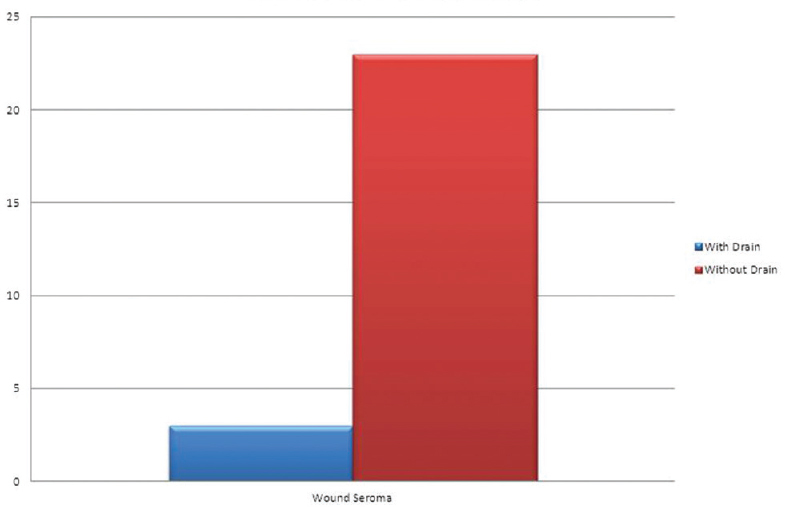 As regards wound disruption, our study showed that there was a significant statistical difference between the two groups as regards the rate of wound seroma (P = 0.001). This high incidence in the no drain group may be attributed to the fact that in the no drain group we did not suture the subcutaneous tissue. Kumar  also showed a significant difference. The incidence of wound disruption was 4% in the drain group and 20% in the no drain group (P = 0.02). Other studies showed a nonsignificant reduction, such as the study by Magann et al. , who reported that the incidence was 9% in the drain group and 10% in the no drain group (P = 0.85). Moreover, Ramsey et al. found that the incidence of wound disruption was 15% in the drain group and 22% in the no drain group (P = 0.17). As regards postoperative pain, our study showed that there was a significant statistical difference between the two groups (P = 0.01). Khalifa et al. found that there was also a significant difference between the drain and no drain groups as regards the mean postoperative pain (P = 0.01). In the CAESAR trial (2010), a randomized controlled study on 3033 women to compare the effect of alternative surgical techniques on adverse outcomes, assessment of the postoperative pain at the time of hospital discharge and 6 weeks after the CS was carried out, and there was no significant difference between the drain and no drain groups (P = 0.2 and 0.1, respectively) . Kumar  also used a 10 cm VAS and found no significant difference between the drain and no drain groups (P = 0.06). As regards postoperative fever, our study showed that there was no significant statistical difference between the two groups (P = 0.2). Other studies also showed this, such as the study by Khalifa et al. , in which the incidence was 10% in the drain group and 15% in the no drain group (P = 0.3). In CAESAR trial (2010), there was no significant statistical difference between the two groups but the incidence of febrile morbidity was about 1% in both groups, and this may be due to the difference in definition of febrile morbidity. Febrile morbidity was defined as temperature less than 39°C on any occasion, but in our study the rise in temperature more than 38°C after the first 24 h postpartum was recorded . As regards the duration of postoperative hospital stay, our study showed that there was no significant statistical difference between the two groups (P = 0.6). We agree with other studies, such as the study by Ochsenbein-Imhof et al. , who reported that the duration was 0.9 days less in the no drain group (P = 0.7), and the CAESAR trial (2010) as the duration of hospital stay was 4.8 + 1.9 days in the drain group and 4.7 + 1.8 days in the no drain group (P = 0.09) . Uniquely to our study, the need for redressing was compared and showed that there was a significant statistical difference between the two groups (P = 0.001). We found that the routine use of subcutaneous drain for lean women undergoing CS can only reduce wound seroma, wound disruption, postoperative pain, and the need of redressing. However, there was no added benefit as regards other wound complications such as wound infection and postoperative fever. Gad MS, Abd MM, Sttar E, Abd AM, Gayed E, Mahmoud NF. Evaluation of lower segment cesarean section scar by sonography. Menouf Med J 2015; 28:873–878. Hofmeyr GJ, Mathai M, Shah AN, Novikova N. Techniques for caesarean section. Cochrane Database Syst Rev 2008; 1:CD004662. Magann EF, Chauhan SP, Rodts-Palenik S, Bufkin L, Martin JN, Morrison JC. Subcutaneous stitch closure versus subcutaneous drain to prevent wound disruption after cesarean delivery: a randomized clinical trial. Am J Obstet Gynecol 2002; 186:1119–1123. Tully L, Gates S, Brocklehurst P, McKenzie-McHarg K, Ayers S. Surgical techniques used during caesarean section operations: results of a national survey of practice in the UK. Eur J Obstet Gynecol Reprod Biol. 2002; 102:120–126. Gates S, Anderson ER. Wound drainage for caesarean section. Cochrane Database Syst Rev 2013; 13:CD004549. Khalifa AAA, Abdelrazak KM, Abdelazim IA. Routine subcutaneous drain versus no drain in cesarean section for diabetic obese women: a randomized controlled trial. Int J Curr Microbiol Appl Sci 2015; 4:479–485. Ramsey PS, White AM, Guinn DA, Lu GC, Ramin SM, Davies JK, et al. Subcutaneous tissue reapproximation, alone or in combination with drain, in obese women undergoing cesarean delivery. Obstet Gynecol 2005; 105(Part 1):967–973. 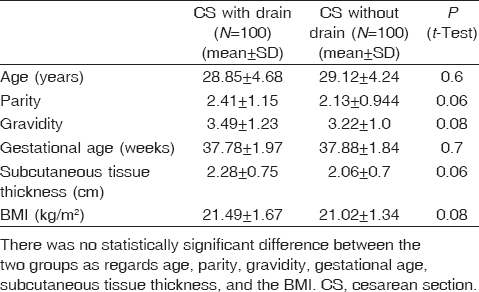 Ochsenbein-Imhof N, Huch A, Huch R, Zimmermann R. No benefit from post-caesarean wound drainage. Swiss Med Wkly 2005; 131:246–250. Al-Inany H, Youssef G, Abd El Maguid A, Abdel Hamid M, Naguib A. Value of subcutaneous drainage system in obese females undergoing cesarean section using pfannenstiel incision. Gynecol Obstet Invest 2002; 53:75–78. Allaire AD, Fisch J, McMahon MJ. Subcutaneous drain vs. suture in obese women undergoing cesarean delivery. A prospective, randomized trial. J Reprod Med 2000; 45:327–331. Kumar SA. Subcutaneus drain versus subcutaneus stitch closure to prevent wound disruption after cesarean section. J Obstet Gynaecol india. 2004; 54:237–242. Brocklehurst P. Caesarean section surgical techniques: a randomised factorial trial (CAESAR). BJOG. 2010; 117:1366–1376.